A night of readings and revelry a Monastiraki! 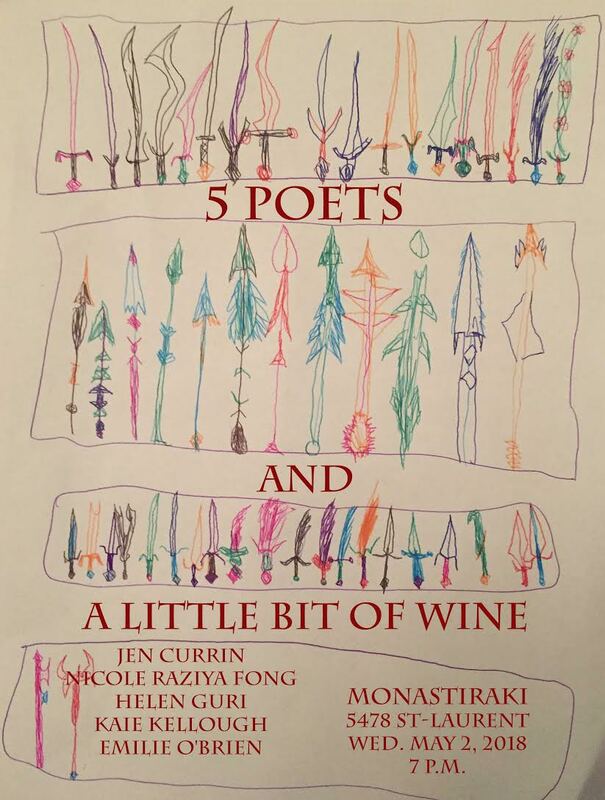 With writers Jen Currin, Nicole Raziya Fong, Helen Guri, Kaie Kellough, and Emilie O'Brien. Helen Guri is the author of Match, published by Coach House Books in 2011 and shortlisted for the Trillium Book Award for Poetry, as well as two chapbooks: Here Come the Waterworks and Microphone Lessons for Poets, both published by Book*hug. Her poems and essays exploring relation, ecology, sexuality, identity, and accountability have been published widely in Canada, as well as in the U.S., Australia, and Japan (in translation). Nicole Raziya Fong lives in Montreal. Past work has appeared in publications including Cordite, Poetry is Dead and The Volta, enacted as a dance performance and compiled as a chapbook in the Poetry Will Be Made By All project. 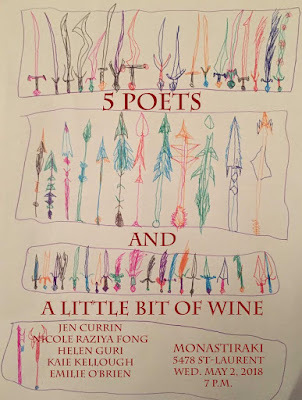 Her first book of poetry is forthcoming from Talonbooks in Spring 2019. Kaie Kellough is a novelist, sound performer, and poet. His novel Accordéon, published in 2016, was shortlisted and written about. His work migrates between poetry and fiction, between Canada, South America, and the Caribbean, and between text and sound. Emilie O’Brien is an artist, mother and art restorer living in Montreal. She currently uses sculpture, embroidery and text works to explore themes of connection and mutual dependence between ourselves and the world we live in.